Read First Amended Complaint as filed Mercadante et al. 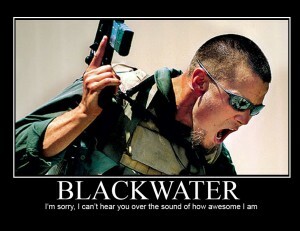 v Blackwater et al here. WASHINGTON, DC (September 21, 2011) – Since 2007, Blackwater Industries, which has changed its name to Xe Services, has employed over 10,000 personal security specialists to perform operations in Iraq and Afghanistan under lucrative contracts with departments of the United States Government including the State Department and CIA. While employing these individuals, many of whom are decorated veterans of the armed services including Special Forces, Army Rangers, Navy Seals, Blackwater sought to avoid millions of dollars in taxes, withholding, and payments of benefits to these employees by classifying them improperly as independent contractors.